Dolores Gloria was born March 24, 1931 to Everett L and Hazel M (Milam) Moore near Minot, North Dakota. In October of 1939 she moved with her family to Carroll County, Indiana, near Delphi. Dolores’ father passed away in 1947 when she was 16. Dolores lived with and cared for an elderly couple near Rensselaer, IN from 1950 until 1956. She then moved to Urbana, IN to live with her mother and worked at the Blue Star restaurant in Wabash, IN. In 1970 Dolores was hired at International Harvester in Fort Wayne, IN and moved to Huntington, IN where she lived in an apartment she loved. She met Virsel Hamrick during this time and they were united in marriage on February 21, 1971. They lived in Ft Wayne and enjoyed life together for a little over 8 years until Virsel passed away April 12, 1979. Dolores began corresponding with Wilber Squires (Webb) by mail and they were united in marriage on March 2, 1980. Webb and Dolores lived in St Clair, Michigan and owned and managed rental property until Webb passed away January 15, 1991. In 1995 Dolores moved to Seattle, Washington area to be near some of her cousins. She bought a house in Puyallup and made her home there. Dolores had a small business buying and selling jewelry. She was active in church and had many friends. 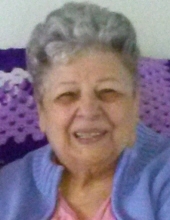 When Dolores had to give up driving because of her eyesight she spent her days keeping in contact with friends by email and enjoyed listening and watching radio and TV ministries. Dolores was preceded in death by her companions, her parents, 2 brothers, Roland and Lyle, sister-in-law Cleo and 2 nephews. Surviving is a sister-in-law, Mary Brovont, 2 nephews, 4 nieces and many friends and cousins. To send flowers or a remembrance gift to the family of Dolores Squires, please visit our Tribute Store. "Email Address" would like to share the life celebration of Dolores Squires. Click on the "link" to go to share a favorite memory or leave a condolence message for the family.